Thank you very much for your informative comment. Its wonderful to hear that the design of Dr. McCall's office had such an impact on you. If you have any other memories or thoughts, please feel free to contact me at the email address below. 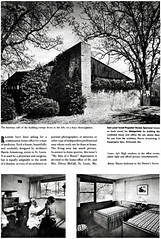 If you brother is interested, I'd enjoy speaking with him about his Armstrong house.